Millions of Californians would not be able to smoke tobacco inside their own homes under new legislation that would raise the bar nationwide for fighting secondhand smoke. Levine’s bill would permit outdoor smoking near apartments or condos, but only in a clearly marked area that is at least 20 feet from any housing unit and 100 feet from a playground, school or pool. Who could have predicted that ignoring property rights and letting bad science go unchallenged would lead to this? If a time traveler from the early 1990s were to arrive in the U.S. bars and restaurants of today, what would notice first? Perhaps that the food has become more interesting and varied, or that a perplexing number of diners are photographing it with their remarkable phones. The most obvious change, however, might register on the nose: the nearly complete absence of indoor smoking. California implemented the United States’ first modern statewide smoking ban in 1998. Today twenty-nine states and 703 municipalities require bars and restaurants to be smoke-free, according to data maintained by the Americans for Nonsmokers’ Rights Foundation (North Dakota brought the tally to thirty states this month). Tobacco use has been banished from our culinary radar along with the question “smoking or non?” Most of us don’t miss it. Yet as a slew of new bans, taxes, and regulations drive smoking to the peripheries of society, it’s worth giving tobacco another look. Read the whole thing. And for more context on some of the arguments, see my recent posts about the effects of new tobacco taxes and the failure of the FDA to establish an effective regulatory regime. This is the same Julien Guttman who lamented a couple weeks ago, “No matter how much science we have to back up what we are saying, there will always be individuals who see this as a restriction on their freedom.” Perhaps it’s a sign of progress that she feels the need to resort to such euphemism when defending the policy. A bit more on the shaky science behind outdoor smoking bans here. The researchers found that the pollution level in smoking areas of the five airports was 23 times as high as the level in nonsmoking airports, and the average in adjacent areas was five times as high. The study, in the Nov. 20 issue of the Morbidity and Mortality Weekly Report, notes that no level of secondhand smoke exposure is safe, and even brief exposures can have adverse cardiovascular and respiratory effects. Since it is difficult even to measure the health consequences of long-term, relatively intense exposure to secondhand smoke among people living with smokers for decades, how could one possibly demonstrate an effect from, say, a few molecules? It’s clear that the vast majority of people exposed to secondhand smoke suffer no noticeable injury, so in what sense is their exposure unsafe? “No safe level” is an article of faith, not a scientific statement. And yet, unfortunately, the “no safe level” idea continues to be used as an easy shortcut by researchers — and then dutifully transcribed by health reporters. Colleges and universities have become the latest target of anti-smoking groups. While schools have long banned smoking indoors, the new bans are addressing outdoor space. So far, more than 800 schools have banned smoking on campus, according to the American Nonsmokers’ Rights Foundation. The list is dominated by medical schools and non-residential community colleges, although more and more residential colleges and universities are joining. Those crazy individuals! The idea that there is “no safe level of exposure to second-hand smoke” is itself unscientific, a line of propaganda devoid of any measurement or relation of exposure to risk. If taken literally it would lead to absurdities like… well, like banning smoking in wide-open expanses of outdoor space. Measure 4 bans smoking in places where North Dakota state law previously allowed for it, including bars, tobacco shops, taxis, motel rooms and private nursing home rooms. The ban also requires smokers to be at least 20 feet away from buildings. Tobacco-less e-cigarettes are also included in the ban. Violators could be fined $50, and bars that still allow smoking could be subject to having their liquor license revoked. North Dakota will be the 30th state to implement a smoking ban in bars and restaurants, but few are this restrictive. 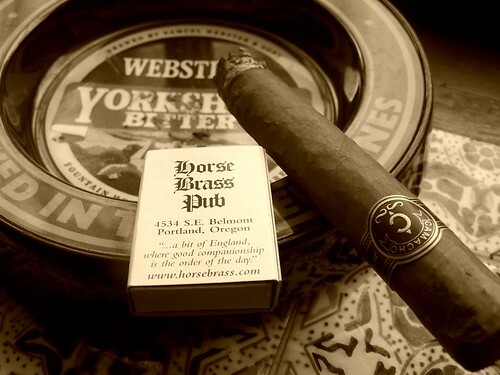 The impact on cigar bars and tobacco shops could be devastating, as Stogie Guys reports. This is speculative, but I imagine that the average North Dakota resident is not so intolerant as to object to smoking in these specialized businesses. However the anti-smoking groups who pushed this initiative didn’t give them the option to allow exceptions, forcing voters to choose between all or nothing.